This indicator is no longer being updated. The latest data are available in the following indicators - EN31. In the production of electricity and heat in thermal power plants and combined heat and power plants 55% of input energy was lost in the year 2010. Due to a lack of new investments, the efficiency of electricity production and of electricity and heat production is improving too slowly. 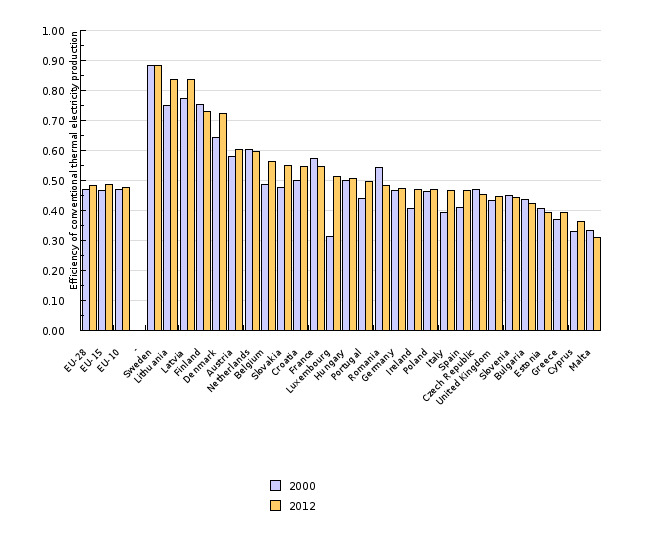 Compared to the EU-27, Slovenia produced electricity and heat 4 percentage points less efficiently. The indicator shows the efficiency of electricity production, which is defined as the ratio of gross electricity production to the energy input in the form of fossil fuels (as well as wood biomass and waste). The efficiency of production of electricity and heat is defined as the ratio of gross electricity and heat production to the energy input in the form of fossil fuels (as well as wood biomass and waste). The indicator considers electricity and heat production and the consumption of fossil fuels in public thermal power plants, combined heat and power plants and autoproducers that do not have electricity and heat production as their primary activity. - to increase the efficiency of electricity and heat production through technological improvements to the transformations sector, switching of fuel and increased share of combined heat and power (cogeneration). Objectives summarised by: Resolucija o Nacionalnem energetskem programu (Resolution on the National Energy Programme, Official Gazette of the Republic of Slovenia, No. 57/04). - Database available on EUROSTAT’s website: Environment and energy > Energy > Energy Statistics – quantities > Energy Statistics – supply, transformation, consumption > Supply, transformation, consumption - all products - annual data > B_101001 Input to conventional thermal power stations. Data administrator: the Statistical office of the Republic of Slovenia (Jože Zalar, Mojca Suvorov) or EUROSTAT. Data processing methodology: Efficiency is calculated as the ratio of electricity production or the production of both electricity and heat in thermal power plants to the consumption of fossil fuels, wood biomass or waste. The indicator is expressed in percentage points. Annual growth is occasionally shown in percentage points. A percentage point is a unit used in comparing different percentages. In percentage points, we are dealing with an absolute comparison calculated using the following formula: (nthis year) – (nlast year) = 16 % – 15 % = 1 pp (e.g. if there was a 15 % growth last year and a 16 % growth this year, then this year growth is 1 percentage point higher). The difference in growth can also be expressed by relative comparison using the following formula: [(nthis year/nlast year) * 100] – 100 = [(16 % / 15 %) * 100] – 100 = 6.7 %. In this case, growth is expressed in percentage points. Geographical coverage: The EU-27 countries are the EU Member States: Austria, Belgium, Bulgaria, Cyprus, the Czech Republic, Denmark, Estonia, Finland, France, Germany, Greece, Hungary, Ireland, Italy, Latvia, Lithuania, Luxembourg, Malta, the Netherlands, Poland, Portugal, Romania, Slovakia, Slovenia, Spain, Sweden, the United Kingdom. The EU-25 countries are the EU Member States excluding Bulgaria and Romania. The EU-15 are the EU Member States prior to enlargement (Austria, Belgium, Denmark, Finland, France, Germany, Greece, Ireland, Italy, Luxemburg, the Netherlands, Portugal, Spain, Sweden and the United Kingdom). The EU-10 countries are Member States that acceded to the EU in 2004 (Cyprus, the Czech Republic, Estonia, Hungary, Latvia, Lithuania, Malta, Poland, Slovakia and Slovenia). - Advantages and disadvantages of the indicator: The quality of data used for the indicator for the 1992-1999 period is questionable due to changes in the statistical processing of data (e.g. at the beginning of the period, the entire consumption of fuel by autoproducers was included in transformations, while at the end of the period only the part that was intended for the production of electricity and heat intended for sale, which improved the efficiency). This is why only the calculations for the 2000-2008 period have been used in analysing indicator trends. Reliability of the indicator (archival data): Data reliability for the 1992-1999 period is limited due to reasons described above, while data for the 2000-2008 period are reliable, as a single source has been used (the Statistical Office of the Republic of Slovenia) and data have been processed using the same methodology. - EEA, 2012. 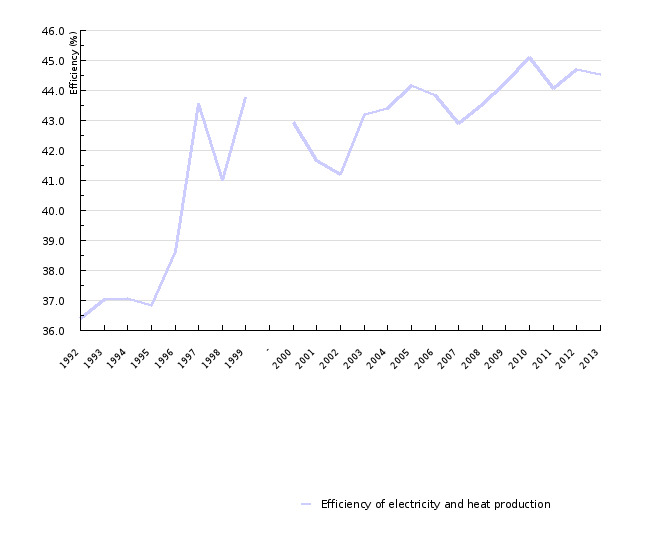 ENer19 Efficiency of conventional thermal electricity production. - Ministry of the Environment and Spatial Planning, 2009. Operativni program zmanjševanja emisij toplogrednih plinov do leta 2012 (Operational Programme for Limiting Greenhouse Gas Emissions by 2012). - Šoštanj Thermal Power Plant, 2011. BilTEŠ 2010- Annual reports. - Point Carbon, 2012. Point Carbon web page: http://www.pointcarbon.com/. - Urbančič, et. al, 2011, NEP 2011 - Dolgoročne energetske bilance NEP do leta 2030 – IZHODIŠČA. - Urbančič, et. al, 2011a, NEP 2011 - Dolgoročne energetske bilance NEP do leta 2030 – REZULTATI.